 20 raised magnets help maintain the original shapes of flies. 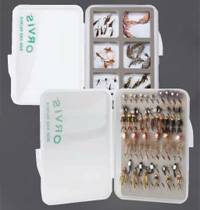  Best for larger flies such as Intruders and saltwater flies.  Raised magnets help maintain the original shapes of flies. 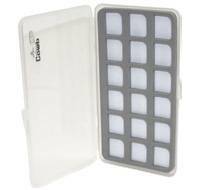  Clear top enables easy identification of flies inside. 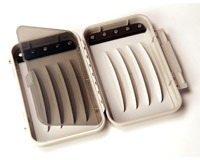  Best of Show Award: FLY CASE / STORAGE SYSTEM. 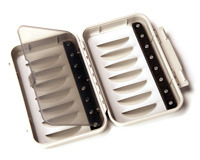  Best for larger saltwater flies and steelhead patterns.  16 raised magnets help maintain the original shapes of flies. 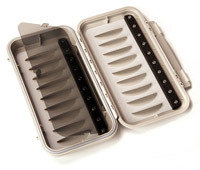 Vision's new family of Fly boxes has three generations: Slim, Fit and Tube. 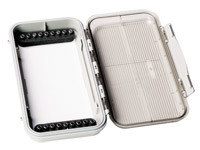 Made from durable yet lightweight ABS plastic and sporting Vision Fish print design on one side, the top remains clear so you can know quickly which of the boxes you crammed into that pocket has to come out first! - Triangle-cut- out reference foam (7 rows, 11 slots s per row). Great for smaller (16 to 24) bead-head nymphs, parachute patterns.